http://www.etsy.com/shop/lemonaday. size 8 in x 6 in 20cm x 15cm watercolour on heavy weight rag paper. This was the hottest day of the year so far for me. No1 son and I went to West Dean Gardens in Sussex to meet a friend of mine. He grumbled all the way there and all the way back but I felt it was worth it to see him get a bit of fresh air and slight exercise. The gardens were (and still are) resplendently worth it. Anything my friend or I had grown they had grown better, bigger and with more flowers. The borders in the fruit tree garden are just dripping with clematis and rose and fantastic herbaceous perennials. Needless to say I did not remember a camera. 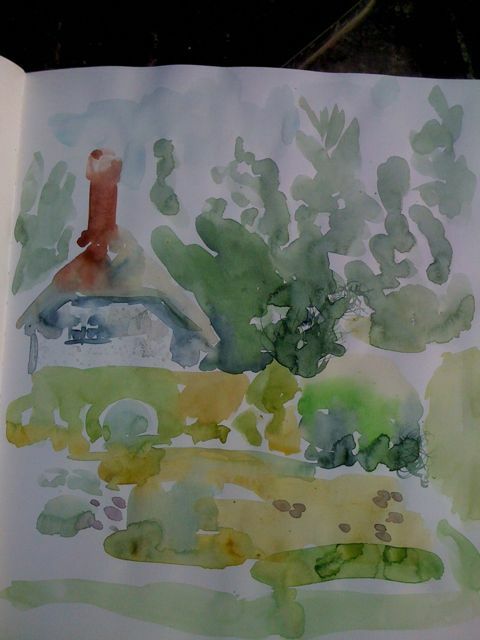 I did do a big wet watercolour sketch of one of the lodge houses. I found a daisy from the lawn made a good paint applicator for the flint walls! The walled vegetable garden is a model of its kind as good or better than the one at Heligan in Cornwall. The attention to detail there is phenomenal; the clematis on the tall and dramatic pergola has been persuaded to climb upwards in such a way that its stems form a regular mesh on the stone pillars. The pear trees are in neat drum shapes or trained in the shape of lemon squeezers. We picked over two pounds of strawberries today but I started weighing for jam before working out exactly what today’s haul was. Actually I have to mention the one plant I have anything to do with that was better than West Dean…our strawberries…bigger and more leaves. 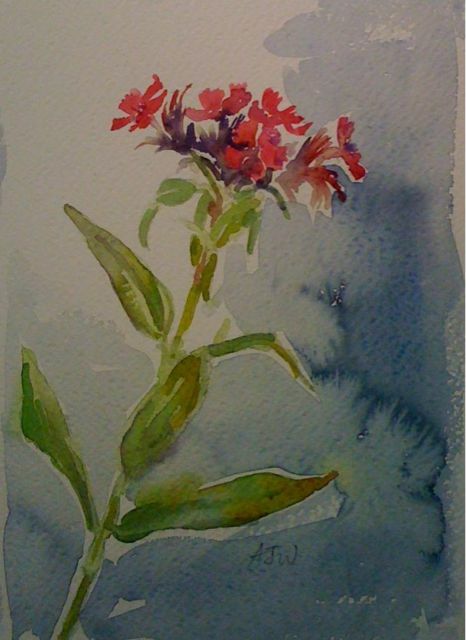 I have also done a quick painting of some lovely Sweet Williams a classic allotment flower if ever there was one. And you can’t go wrong with the mixtures with this as they are such a limited palate that they’ll all go.